Yesterday I was making my rounds on St. Joseph’s Indian School’s campus and ran into the Summerlee Home girls (4th -5th grade) heading out for a walk. They are in temporary quarters while their home is being remodeled. On a Saturday, the maintenance crew was off and no work was being done inside, so I invited the girls and houseparents in to check on the progress. Much of the construction is done and walls are being painted. Damara is a fifth grader and remembers how the home looked last year. She showed the other girls where her bedroom was and could see big changes in the floor plan and space usage. We hope to have them in the home before the school year is out, and get started on the next home. The girls filled me in on plans for one room that even I didn’t know about. In one of the family rooms they hope to have a mini “beauty parlor.” The last few years the Summerlee girls have been cutting and counting donated soup labels and box tops so they can redeem them for a vanity with nice mirrors. If they get enough they even want to get a beauty shop chair and sink that they can lean back in and get their hair washed. Probably very different from what 10-year-old boys want in their house, but a fun and exciting possibility. The girls had so much fun jumping and climbing around! After the home tour they invited me to walk downtown with them. They were headed for the McDonald’s a mile south of campus. 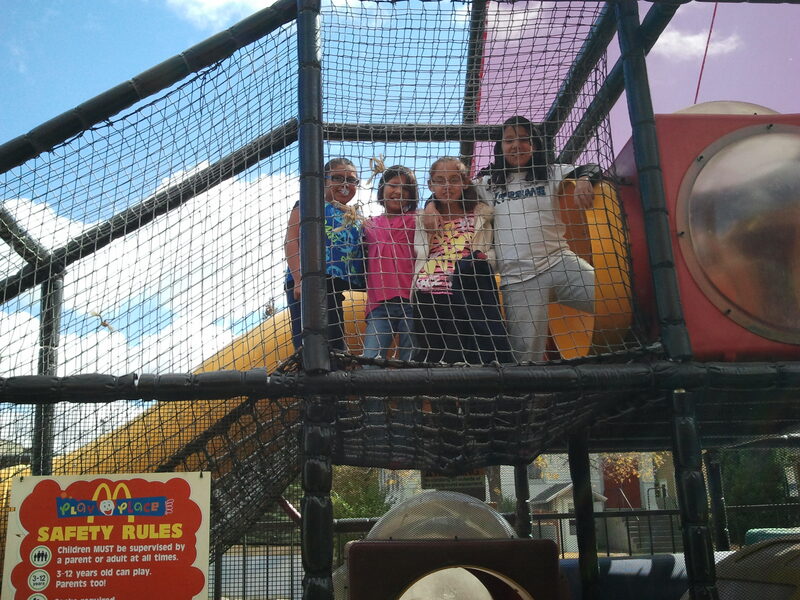 Each of the girls got to choose three items off the dollar menu and enjoyed lunch on the town. Afterwards they made a beeline for the play area. Fourth and fifth graders are still at an age where they have the freedom to enjoy slides and climbing ropes. It did my heart good to hear them laughing and giggling. Our final stop on the way home was the Dollar Store. The girls used some of their allowance money to get such luxuries as nail polish, ribbons and barrettes. After the brisk walk they planned to spend the rest of a lazy Saturday afternoon painting their nails and watching a movie. Today at mass, it was Fr. Anthony’s turn to preside and preach. He normally does a fine job, and today he was especially animated. He preached about the gospel quality of being childlike and contrasted that with the selfishness of being childish. To demonstrate his point he acted out a temper tantrum, feet a stomping, and had everyone’s attention. As our children’s choir continues to practice and learn new service music for liturgy, it has added more life and spirit to our prayer times. I appreciate good music so much in creating an atmosphere of celebration and hospitality. I am noticing better sound and participation coming from the rest of the pews. Keep up the good work, and make a joyful noise unto the Lord!